The Welk Resort Hotel boasts one of the best locations in the Branson area — just far enough out to enjoy a bit of peace and quiet, have lovely views of the Ozarks hills, be near the spectacular Table Rock Lake, and still be just a couple minutes from Branson’s famous Strip and all the exciting attractions and shows it offers! Recently redecorated and updated, it has deluxe and premier traditional rooms that include plush amenities, high-end finishes, and decor that reflects the unique charm of the Ozarks with vibrant colors and interesting textures. Interior design details throughout the property are exceptional and reflect the warm and welcoming culture that keeps folks coming back to Branson year after year! The comforts and perks of the Welk Resort go far beyond your hotel room. Special and hard-to-find hotel amenities include a playground, a fitness room, a game room, a gift shop, mini-golf course, and an outdoor patio overlooking award-winning, landscaped gardens. For an extra special Branson lodging experience, there’s even a fantastic 10,000 square foot Splash-A-Torium that features a 100-foot water slide, a kid’s splash-zone, and an indoor/outdoor pool and hot tub! 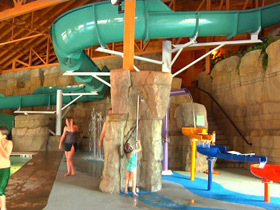 Access to the water park comes with some Branson lodging packages or can be added to others. With convenient meeting and banquet facilities, including an onsite restaurant and lounge, the Welk Resort can also easily accommodate your conference, reunion, or any group gathering or event. The Welk Resort Hotel offers the amenities you expect from Branson lodging and those that’ll surprise you...complimentary WiFi, 32-inch LCD widescreen televisions, coffee makers with high-quality coffees and teas, as well as other exceptional features. Stay in comfortable luxury...stay near the glittering lights and glamorous appeal of Branson’s famous strip...stay a minute away from the greatest lake in Missouri...stay where you can enjoy the peace, quiet, and beauty of the Ozarks landscape...it’s possible only at the extraordinary Welk Resort Hotel!